Better communication between dentists, pharmacists and doctors could prevent a rare bone disease in some patients with osteoporosis and cancer, new research has found. Certain dental procedures, such as tooth extractions, can provoke a condition known as osteonecrosis – or bone death – in patients taking biophosphonates, the most common treatment for osteoporosis. The drugs are also used as part of treatment for some cancers. Osteonecrosis of the jaw is rare but is very difficult to treat and causes significant pain. Sometimes surgery is used to remove the dead bone, but this can be unsuccessful as there is a reduced blood supply to the affected area. The result can be disfiguring and often life-changing for patients. 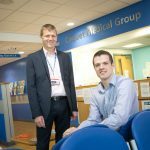 A study into the impact of the disease on patients, carried out by a team from the University of Sunderland, found that much more communication was needed between GPs prescribing the biophosphonates, pharmacists supplying the medicines and dentists managing patient’s oral health. Lead researcher Andrew Sturrock, Principal Lecturer and Programme Leader for the Master of Pharmacy programme at the University of Sunderland, explained: Although this condition is very rare, patients prescribed these medicines should have any dental treatment done before they start taking the drug. They also need to ensure they maintain good oral hygiene and good oral health whilst taking the medicine. “Our findings, however, established that this wasn’t happening. GPs and pharmacists weren’t telling people about the risks for all sorts of reasons; because the disease is so rare, it wasn’t a priority or it’s been forgotten about. In some cases, the patient didn’t disclose they were taking the medicine when needing to have dental treatment. The team interviewed 23 patients nationwide, six of whom had developed osteonecrosis as a result of taking biophosphonates. The remaining 17 participants all had been diagnosed with osteoporosis, of which thirteen had been prescribed biophosphonates. The study, funded by Pharmacy Research UK and the UK Clinical Pharmacy Association, found that patients placed trust in their health professionals and expected that the risks and benefits of any medication should be communicated when the medicines were first prescribed. However, in most cases this didn’t happen, making it harder for patients to make informed decisions. Many said their dentist did ask about drugs they were taken, but didn’t explain what the implications might be. All participants in the study said they would be happy for their information to be shared between health professionals, including communication between doctors and dentists when biophosponates were prescribed. Co-author of the paper, Philip Preshaw, Professor of Dentistry at the University of Singapore, said: “Medication-related osteonecrosis of the jaw is thankfully quite rare, but when it does occur it has a profound impact on patients’ quality of life and can cause significant levels of pain. Co-author Professor Scott Wilkes, Head of the School of Medicine, Professor of General Practice and Primary Care, University of Sunderland and part-time GP in North Tyneside, added: “GPs see a lot of patients who take bisphosphonate medications to protect against osteoporosis and Pharmacists dispense a lot of these medications every day.